Do you wish your freelance writing business were growing faster? When I first got started as a freelance writer back in 2009, I made some stupid mistakes. “I hope no one ever finds out about this” mistakes. Though I had plenty of confidence in my writing skills, I had, oh, six months of experience in the business world. And I certainly wasn’t at the point where I was differentiating between doing the work and running the business. I failed forward, and each and every fumble brought stress and anxiety. That April in 2009, when I got laid off from my job, I had $486 in my bank account. I worried about money a lot. It’s not like I was Warren Buffett or Richard Branson with a wealth of business savvy to pull from. I was making it up as I went. I constantly second-guessed my decisions. Was freelancing the right path for me? Should I start looking for another full-time job? Should I resign myself to a life of feast-or-famine? It didn’t help that some of my freelancer friends who had been at it longer complained constantly about their clients. About how hard freelancing was. About chronic cash shortage. To make matters worse, my own experiences seemed to confirm that writers worked at a disadvantage. If you care about quality and genuinely want to serve your clients, then you have your work cut out for you. Or if say what people want to hear, whether or not it’s true, then you’ll be just fine. Put lipstick on the pig and take it to market. It’s all about the money, baby! Do I have what it takes to succeed as a freelance writer? It seemed like no matter how hard I pushed, nothing budged. Not an inch. Certainly not enough work to pay off my credit card debt. Not enough to save for the down payment on a house. Here’s the thing… I knew I had enough talent. Shoot, everywhere I looked I saw supremely CRAPPY copy. Web content so boring I wanted to punch my computer. Geez… what does a guy have to do to find a friggin’ bone. I wanted to level up, and all of that mediocre writing PROVED that people got paid big bucks to put words together. Why not me? What couldn’t I be the one they paid? Getting high-paying writing clients would later transform my life. Actually exercise the freedom the freelancing had always promised. “How do you go from barely making minimum wage writing stuff no one will ever read to running a friggin’ writing business that makes multiple six figures? How do you get awesome clients to come to you? No. It’s not crazy. I can say that with confidence now. Figuring out the process wasn’t easy. Like I said, I made many mistakes. But our mistakes are often the best teachers. Each flimsy failure can become a concrete building block. Failures don’t stop coming either. Freelancing is hard. Anybody who tells you otherwise isn’t being candid with you. A sustainable content marketing and copywriting business that now averages $18,000 per month. Establish a strong, reliable pipeline of incoming clients and projects, and you’re in a position to do (or not do) all sorts of satisfying things. Do take a vacation and truly unplug because you know things aren’t going to fall apart while you’re gone. Don’t answer emails on the weekend. Do hire an executive assistant to handle tasks you don’t enjoy. Don’t put up with cheap, disrespectful, or unresponsive clients. A strong pipeline gives you walk away power. If a new prospect lowballs you or a client starts acting weird, you remove yourself from the situation. It’s not magic. You cannot avoid the hard work. The key is focusing on one building block at a time. Don’t let the big plan overwhelm you or the dream dazzle you. As I mentioned, I didn’t have a lick of business sense when I got started. I didn’t even know what “freelancing” or “consulting” was. I was a lyric poet, for goodness sake. I wrote free verse. If I can figure out this whole freelance writing game, so can you. Building a profitable writing business starts with very specific objectives. Many of them you can accomplish in 10-15 minutes while you juggle other responsibilities. First things first, let’s hit the pressure release valve. I’m guessing you could use one or two new clients (the good kind)? I’ll share step-by-step instructions to get your name out there and “recruit” several preferred clients (after all, “ideal” doesn’t exist) this week. I’d recommend that you finish the first couple of steps today, even if you’ve only got 10-15 minutes to spare. Focus on incremental improvements. Execute. 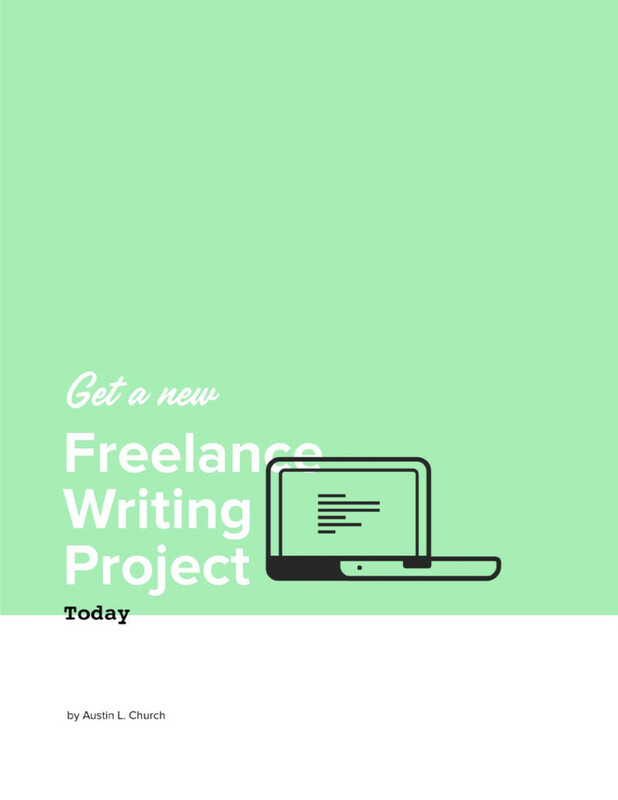 To that end, I’d like to share two things with you should make getting your next freelance writing project less difficult: 1) 4 email templates, and 2) a cheatsheet how to use them.